This month, our SLSG MO Girls Spotlight Team is '99 Liverpool, coached by Brad Hackett, a member of our SLSG community for the past ten years. From U10-U19, Brad and Co-Coach Mike Rami have taken pride in developing the Liverpool players both on and off the field, emphasizing the values of respect and humility during each and every training session and/or game. 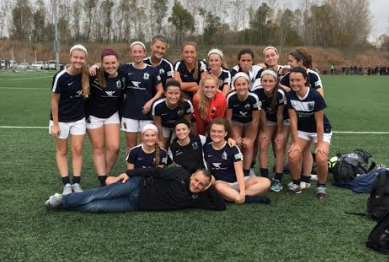 With the girls wrapping up their last season with SLSG this Fall, Club Management deemed it a 'no-brainer' when selecting this week's Spotlight Team. '99 Liverpool has had plenty to smile about in the past several years. The team has enjoyed their fair share of success on the field, reflected in the 2016 President's Cup trophy in addition to several local SLYSA league titles, and maybe most impressive are the numerous player commitments to play collegiately. Coach Hackett attributes the team's success to the player's consistent commitment to one another. When speaking with Brad, his passion for the group was evident, and he has taken pride in watching the girls stay together for so many years. "As a coach, my number one focus has been to make sure that these players follow through on their commitment to the team. Brad went on to say, "These players care deeply for one another. Not only do they encourage and support one another but they hold each other accountable. If one player is not putting in 100% effort at training or games, they will have a team meeting and address the issue on their own". Even with all of their success on the field, Hackett states that the girls "never let it get to their head". "They make it a point to stay respectful to one another, opposing teams, parents, coaches, and officials". This attitude and character should never go overlooked. SLSG staff and management would like to thank Brad and Mike for their dedication and time over the past ten years. Without their efforts, these players would not be where they are today. As for the '99 Liverpool players, thank you. Thank you for representing the club in a respectful and humble manner. Thank you for respecting the SLSG shield on and off the field throughout your time here with the club. SLSG wishes each one of you luck as you move on to college. Please remember no matter how far away you travel, this club will always be a soccer home for you and your loved ones. And finally, and always most importantly, SLSG would like to thank the parents of these young ladies. It is no secret, this club only functions with the support of committed and loyal parents.